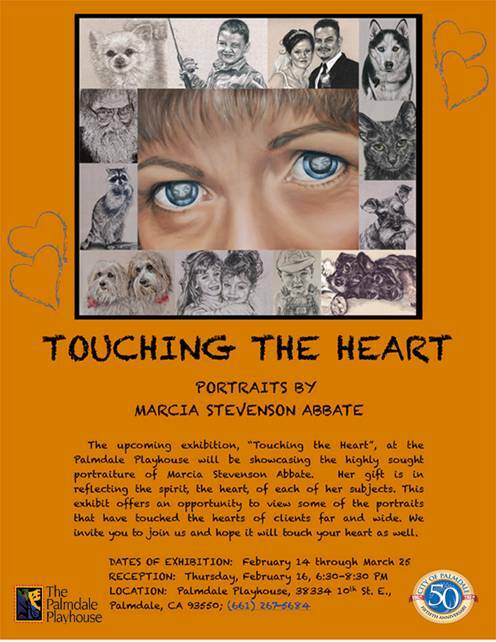 PALMDALE – A free reception to celebrate the new “Touching the Heart” art exhibit will be held on Thursday, Feb. 16, from 6:30 to 8:30 p.m. in the Palmdale Playhouse lobby, located at 38334 10th St. East in Palmdale. The City of Palmdale sponsored event features the work of local portrait artist Marcia Stevenson Abbate. Abbate hails from an artistic family of the same Stevenson lineage as Robert Louis Stevenson. She studied art at Ohio State University where she received her B.S. and M.A. Abbate has considerable experience drawing and painting a wide variety of subjects, but her true passion is capturing the essence of life in portraits. Her work has been featured in local, national and international exhibits and has garnered her numerous awards. Admission to view the exhibit is free and open to the public. Call the Playhouse at 661-267-5684 for hours to view the exhibit during the week. For more information, call the Palmdale Playhouse at 661-267-5684.